The euro currency and equity markets around the world suffered losses on Friday in anticipation of a victory of the Syriza party in Greece. The Syriza are described as a far left party, so far left that some are referring to their approach as communism. The concern of investors and traders lies within ability of Greece to live by the austerity measures put into place by the previous administration in exchange for receiving the EU bailout. Prior to the election, Syriza's stance was one of opposition to austerity but less than 24 hours after being elected there seems to be some signs of backing down from the cornerstone of their campaign. Specifically, Syriza's leaders have already pledged their desire to remain a component of the Eurozone. This was their primary bargaining chip; so most analysts are predicting "more of the same", rather than a dramatic change in the relationship between Greece and other European countries. With this event behind us, traders will finally be looking to this week's Fed meeting. Both stocks and bonds have shown a tendency to grind higher into the Fed; we expect that to be the case in the coming days. The Fed will announce their interest rate decision on Wednesday afternoon. Safe haven buyers bid bond prices spectacularly higher last night as investors were seeking shelter from a possible Greek fallout. 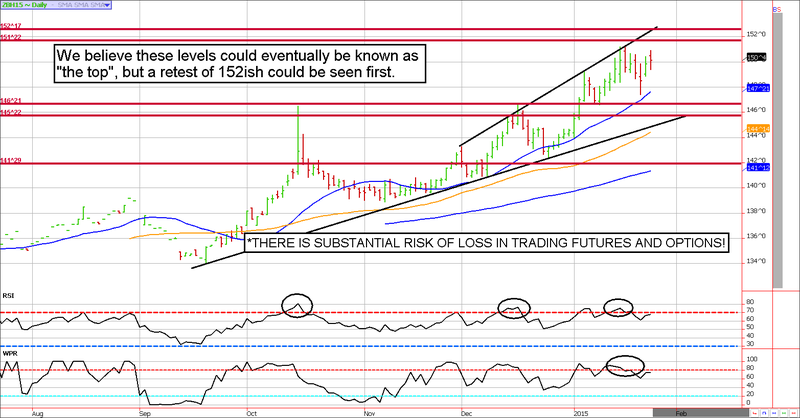 However, as we mentioned above, the implications of the Greek election appear to be contained for now. The overnight "Greek election" Treasury rally fizzled, but with the Fed meeting on tap we suspect buyers will temporarily make their way back to bonds and notes. Further, trading volume in cash market Treasuries is expected to be slow due to storms on the East coast; in such an environment the path of least resistance is often higher. We'll be looking for a place to turn bearish going into, or beyond, the Fed meeting. We continue to be bearish Treasuries, but depending on what happens in currencies, it might be possible to see a 152ish print in bonds before selling comes back to the markets. If prices spike into the 152 area, we'll be shopping around for calls to sell. Seasonal statistics available to us suggest that mid-to-late January dips are typically buying opportunities. In addition, the Stock Trader's Almanac depicts both Wednesday and Friday of this week as being statistically bullish. Accordingly, we are relatively confident the bullish chart pattern and the tendency for stocks to rally into the Fed meeting are corroborating with history. 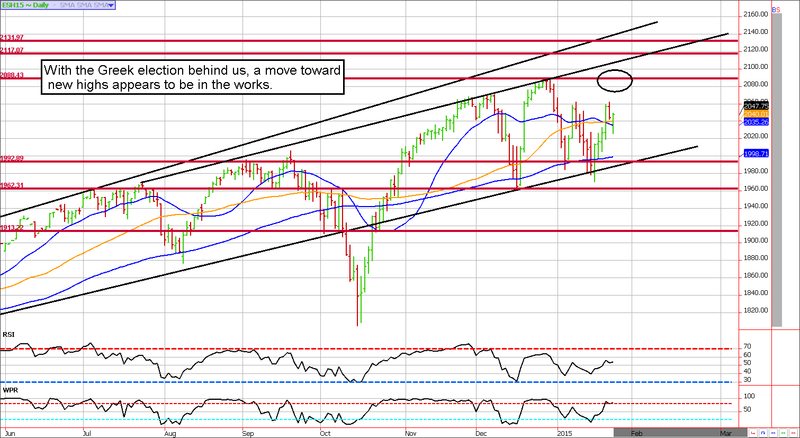 We continue to look for a run toward the top of the trading range. The first target will be 2088ish. **Consensus:** A close above 2051 gives the bulls an edge. We should finally be headed to 2100/2130ish...we just took the scenic route. Look for first resistance near 2088.